The “trick” film has been around since Georges Melies built his own camera in 1896. Special effects sell tickets. Here’s one that admirably combines a handful of animation and filming techniques to create a madcap fancy on film. Vitagraph Studios was founded in 1897 by J. Stuart Blackton, a former journalist and sketch artist, and Arthur E. Smith, a stage magician. They soon found themselves attacked by Edison over patent violations, but soldiered on and eventually worked out a settlement with the litigious inventor. “Princess Nicotine” takes its name from a popular 1893 stage vehicle for the legendarily beautiful singer and actress Lillian Russell, but little else. The film’s marching-cigarette stop-motion concept was attributed to the earlier short animation “The Animated Matches” by French animation pioneer Emile Cohl in 1908. More recent research has revealed that Cohl stole the conceit from English animator Arthur Melbourne Cooper, who made the first stop-motion animation short in 1899, that pled for the donation of matches to British troops fighting the First Boer War in South Africa (the government had forgot to send some, you see). Until it turned out that Cooper had in turn filched the stop-motion concept from its true originators: Vitagraph’s Blackton and Smith. 1898’s “The Humpty Dumpty Circus,” featuring jointed dolls seemingly walking under their own power, was the true first stop-motion film. This illustrates vividly how imitative film was at the time. It was a brand new medium, with no rules. People were making hundreds of films a year, trying anything, seeing what took the public’s interest and responding to that, or blithely going their own way. Repeating formulas, doing knockoffs of others’ successes, things we think of as contemporary problems in the commercial film industry, were present at the beginning. And we see similar patterns of development with the many significant, pervasive mediums that characterized the century. The film is notable for the way it subordinates its effects to its theme, if not a coherent plot. The previous “trick” film discussed here, 1906’s “Dream of Rarebit Fiend,” seems clunky in comparison. Blackton and company craft a fun little romp, utilizing double exposure, stop-motion, and mirror work (Blackton worked as a magician also). Stage experience gave Blackton the sense of knowing what to play to – and the sense to nail the camera down, the better to pull off the many incorporated stage illusions that form part of the film’s charm. (The only cut-in shots are there to make the particular effects work.) It’s a hybrid – a theatrical form now embedded in something a bit more interdimensional. In the film, a gentleman nods off while loading his pipe. Two tiny fairies pop out of a cigar box and play tricks on him. There are oversized props – hay serves as tobacco – and the man traps the fairies in the box. 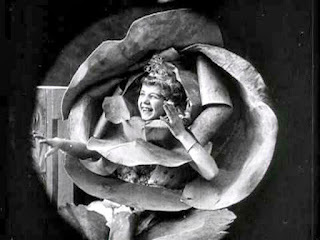 Out of it he pulls a rose that blows smoke at him – his peer through a magnifying glass at it reveals a rose/girl hybrid puffing away gaily on a cigarette European-style, with the third and fourth fingers. The most transcendent moments belong to a rose that takes center stage via stop-motion, then de-petals itself and swirls dreamily into the shape of a dancing, circling wreath that transmogrifies and condenses into a dancing cigar. The man returns, lights up, finds one of the tiny fairies trapped in a bottle, smashes it. She flashes him coyly. He blows smoke at her, she sets fire to the table top, he washes her away with a squirt of seltzer water (could this be the earliest use in film of this ancient gag? ), and manically ends up squirting himself in the face as well. It is often alleged that the film served in part as product placement for Sweet Caporals, a popular cigarette brand of the day; however, a frame examination of brand names on the boxes don’t seem to correlate with any known at the time. If this were a true purpose, that would make this the very first example of the integrated commercial.